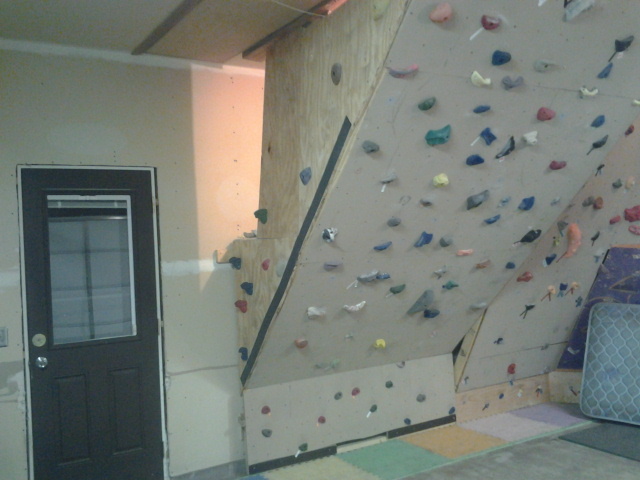 So the story goes like this: I was in our local skate shop picking up an addition for my Garage Climbing Wall. … Wait a sec, I was where??? Yes, you read correctly. My latest upgrade to the garage wall was found at a Skate Shop. 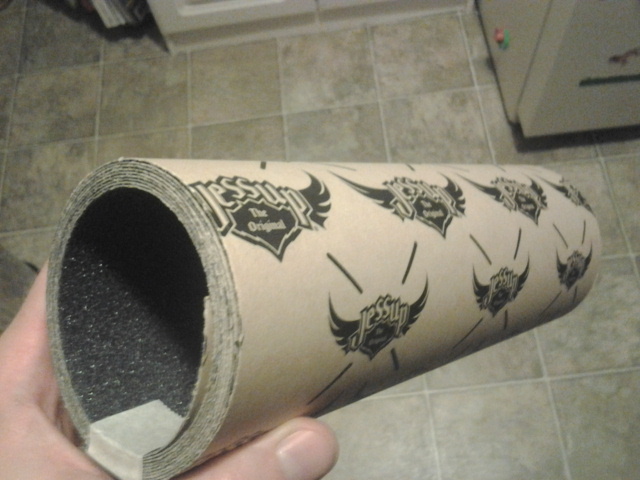 I went there on a mission for a roll of … Grip Tape. Let me show you the reason behind the madness. I took the roll home and I rolled it out. It comes 9″ wide and pretty much any length you want. I asked for 8 ft., but upon measuring I found I got 7 ft. I am totally cool with this since the employee was giving me a deal anyway and making sure it landed on exactly $25 to fit my gift card. I marked it on the back in 3″ increments. And then I cut it. All the way down the length, three strips at 3″ wide. Scissors worked better than a razor blade but I’m positive they are less sharp now than before I began. 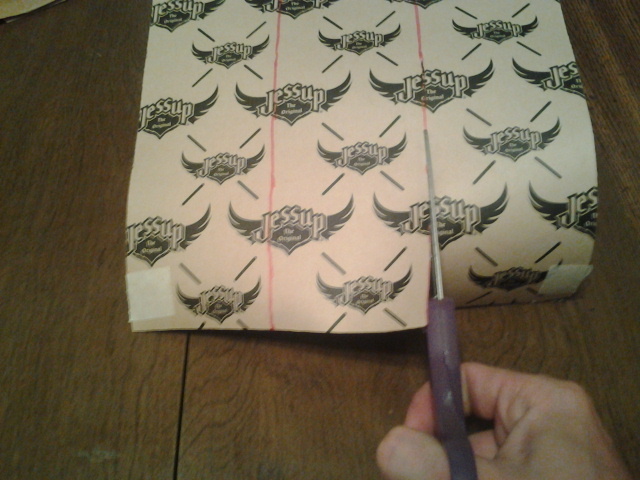 My next step was adhering the strips to the aretes of the wall. So far I have strips up on both sides of the 45* wall and a little bit in an odd crease between my 23* and transition walls (one more to go on my far right 23* arete). 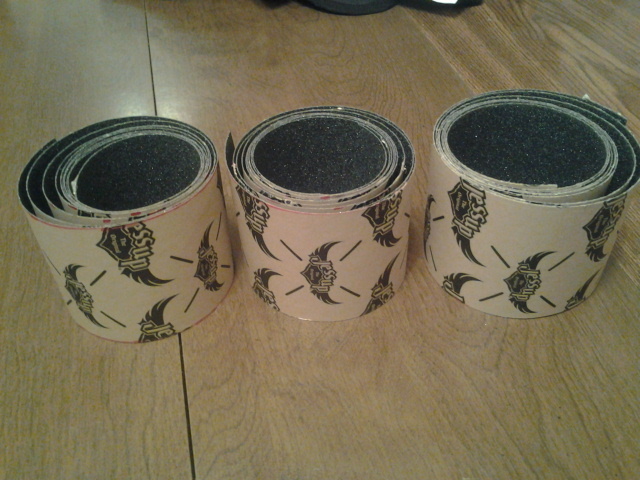 They work great for bumping up the arete and liebacking. Adding just enough texture without ripping the skin. 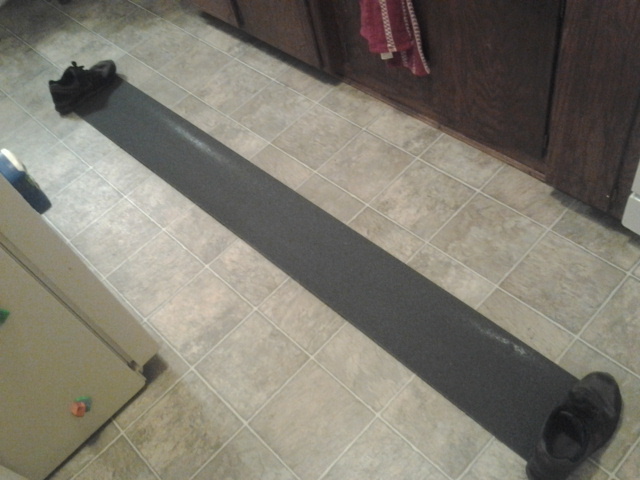 And that is my Sneaky Skate Shop Solution. What unusual climbing solutions have you come up with??? What’s New … What Next!?!? 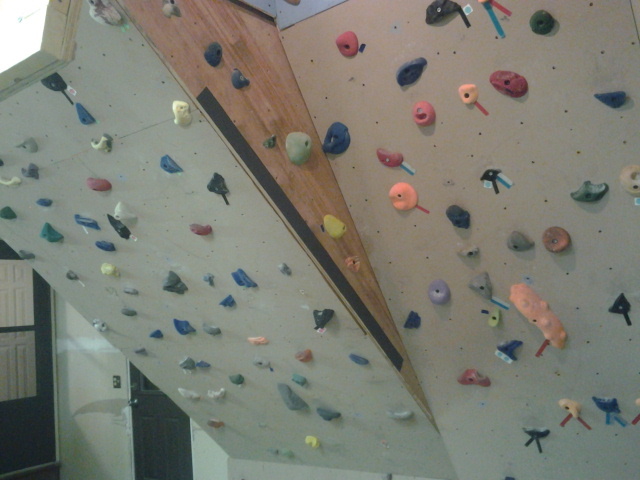 I think it’s probably needless to say, I’m obsessed with climbing. It’s pretty much on my mind throughout the day and I am often scouring the interwebs for new and insightful content. Videos, blogs, articles; you name it. So one day I was on 8a.nu and I saw a banner ad featuring World Cup phenom Jakob Schubert and a new version of the climbing harness. I was intrigued because I just happened to be in the market for a new harness as my current one is WELL overdue retirement (think Chris O’Donnell in Vertical Limit). So I clicked on the ad. And this is what I found. I kind of like the idea behind these. In case you decided not to click on the photo above (thus bringing you to the Mammut product site), they are shorts that have built in harnesses. Or are they harnesses that have built in shorts? Either way, they appear comfortable. Fairly stylish. And they are probably going to be a big hit on the comp circuit. But what about the ‘Rest of Us’? Here is my best guess on what this product would need for me to fork over my hard earned $$$. Shorts are great for indoor climbing and warm climates. But I live in Minnesota. If I were to spend $200 on a harness, even a combo like this, I would want the good old zip-off pant legs. Remember those? I don’t want to have to have a regular harness plus my awesome Realization Shorts in the event it is too cold to go bare legs outside. I can see this added versatility being a great increase in market share. I guess the only other option I would ask for is additional color options. Like my all-time favorite, Black with Red accents. I guess that only leaves one more question for me… What’s next??? Booty Short Harnesses for the ladies?!?! I’m joking, please NO!